Where's the Fitzrovia Marylebone Border? Fitzrovia West proposed in November 2013 to include a significant patch of land West of Great Portland Street, long been considered part of Marylebone, into its area of neighbourhood planning influence. Many local residents objected especially to the idea that parts of Portland Place, Hallam Street and the West side of Great Portland Street would be lost to influence from streets further East. Fitzrovia West had requested to take control of planning decisions on parts of Portland Place. Result: NO – all of Portland Place is designated as within the Marylebone Forum’s area. 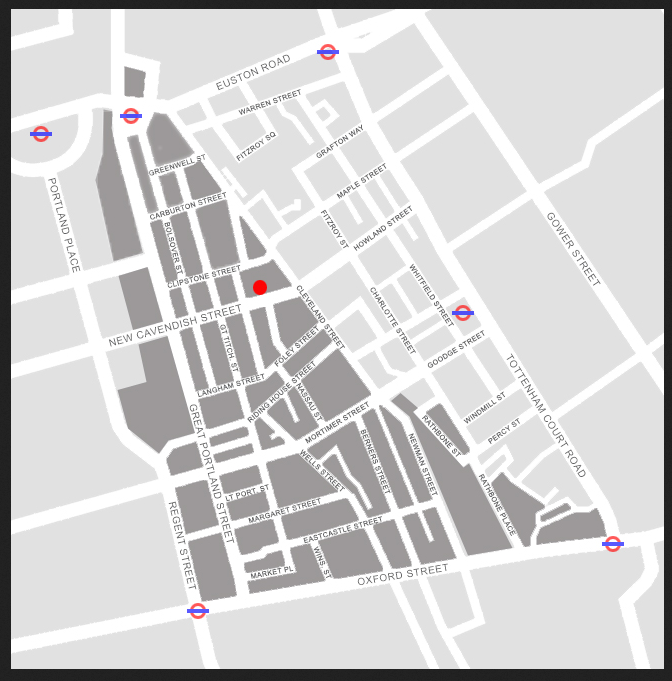 Fitzrovia West had at one stage put forward the idea of including over half of Hallam Street into their Forum. Result: NO – All of Hallam Street is designated as within the Marylebone Forum’s area. 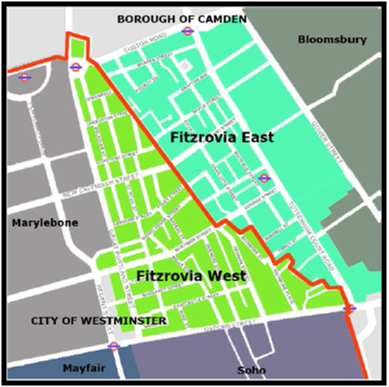 Fitzrovia West wanted to take control of planning decisions over all of Great Portland Street which locals see as the agreed border between Marylebone and Fitzrovia. Result: Mixed – Some sections of the West side of Great Portland Street are in Fitzrovia West’s zone of interest. Other sections of the West side of Great Portland Street remain in the Marylebone Forum area – see map below for great detail. Where are you now on Great Portland Street? Marylebone Forum Area lies below the red line. Locals will now have to see how Fitzrovia West (with as yet little support on Great Portland Street) will work to improve this thoroughfare in cooperation with the likes of Sammy Tak Lee’s Langham Estate (see how Langham’s footprint on Great Portland Street matches border line in map above) and Great Portland Estates. Despite being major stakeholders on the Great Portland Street, The Langham Estate does not seem to share the same aspirations as the Howard de Walden or Portman Estate for real area improvement. As such, there is a real risk that Great Portland Street will likely continue to languish. Westminster also assessed that 83% of Fitzrovia West’s floorspace is ‘commercial’ while only 17% is residential. 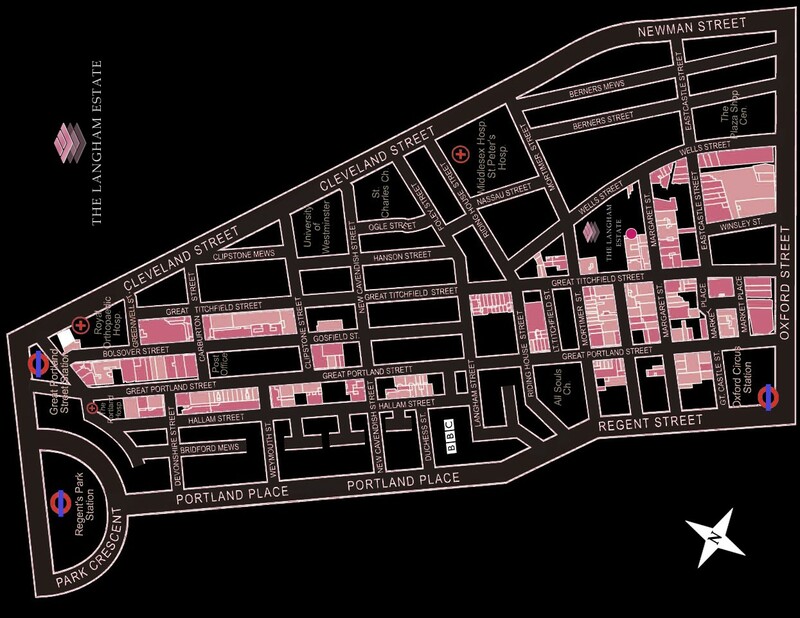 As a result, the Fitzrovia West neighbourhood will be viewed as a ‘business area’. Any Fitzrovia West plan for the area will now be subject to an additional referendum of businesses and residents. It remains to be seen how Great Portland Street will prosper should the Fitzrovia West Forum be unable to work with other stakeholders in the area — especially the Fitzrovia Neighbourhood Association. NOTE: Regardless of the details of these outcomes the Marylebone Association is the amenity society that continues to represent the West side of Great Portland Street. Please remain vigilant and actively engaged. Local residents and businesses should continue to address their local concerns to the Marylebone Association. Locals ensure that border between Marylebone and Fitzrovia remains in place. On Wednesday, November 13th,2013 a meeting of the initiative supporting a Fitzrovia West Neighbourhood Forum (FWF) took place at University of Westminster, 115 New Cavendish Street. Only properties on the East side of Great Portland Street up to the Westminster boundary had received leaflets informing them of the meeting. Marylebone residents from the West Side of Great Portland Street were alerted about the meeting by the Portland Village Association. Over 20 Marylebone residents from the West side of Great Portland Street, as well as members of the Portland Village Association and the Marylebone Association (MA) attended the meeting – there were probably about 80-100 persons present in total. 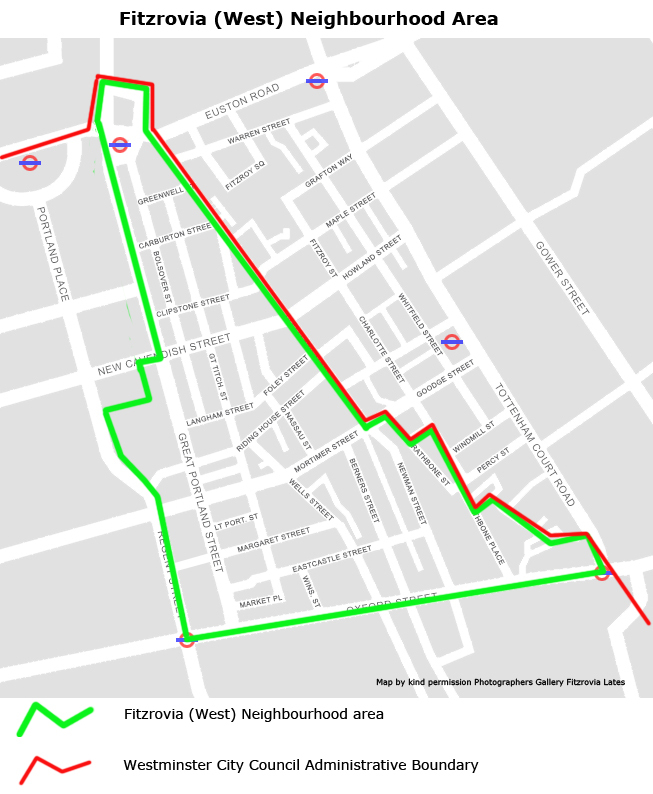 The Meeting was called to discuss ‘boundaries’ for the Fitzrovia West Neighbourhood Forum. In its official application, the Forum Steering committee had put forward a map which included parts of Marylebone that are currently under the remit of the MA (Map 1). Before the meeting the organisers had drawn a new map (which they published on their website – Map 2), which included in the FWF an even greater area of Marylebone. At the beginning of the meeting, residents from the West side of Great Portland Street expressed their dismay that no leafleting had taken place on their side of the street, despite the attempt to include their area in the FWF. The feeling was that the FWF organisers were trying to sneak the boundary discussion past the residents on the West side of Great Portland Street without proper consultation – tempers were still raised by the time the meeting broke up. Eventually, after a presentation by Griff Rhys Jones, the discussion moved on to the subject of boundaries. A Fitzrovia Neighbourhood Association representative (FNA) then clarified the ‘historic’ border (Map 3). Thanks to this clarification, it was quickly established that residents and businesses on the West side of Great Portland Street did not want any straying from the agreed border between the MA and the FNA (neighbourhood amenity societies). Over 20 residents from Great Portland Street, Hallam Street, Weymouth Street New Cavendish Street, Devonshire Street and Portland Place (many representing the residents’ association in their respective blocks) made their opposition to being included in the FWF very clear. Later, another resident of Great Titchfield Street also tried to make a point in favour of including Hallam Street in the FWF, but again Hallam Street residents stopped this discussion from going any further. Fitzrovia vs. Marylebone? The West Fitzrovia initiative to cut into Marylebone is most unfortunate as it creates a sense of division where none was felt before. At the end of the meeting, the organisers of the FWF agreed to write to Westminster in order to amend their original proposal – please see the revised attached (Map 4) that they published on their website. Portland Place, Hallam Street and all of Great Portland Street was recently found in Fitzrovia. The confusion about where Marylebone and Fitzrovia begin and end recently found its way onto the Official OS Maps of the area. OS Maps have been alerted to this error and it is expected to be resolved shortly. OS Map Issue – Marylebone and Fitzrovia error over Portland Place. The Blue line marks the length of Great Portland Street.